I am surveying another beaver flooding, crunching over thin ice formed where the raised pond water just covered the trail before freezing, stopping where the trail makes a sudden drop. Its just above freezing but a Taku wind pattern has set in to make walking uncomfortable on more exposed trails. Clear, windy days are best spent in relatively unmolested spruce forests that touch a beach where looking up offers a view of blue sky crowded with the tops of hundred foot tall Evergreens. Shafts of light radiate small patches of forest green, Wind driven surf sighs while breaking on the nearby beach. I’d sigh with the surf to release beaver frustration if the ice layer over their newly flooded territory did not glow with beauty where struck by sunbeams. Its a rare and puzzling thing—this arrival of Taku conditions before forest understory plants could send the last of their summer energy to root or the snow could insulate them. Most plants look shocked by sudden onset, leaves cringing, surprised by the killing frost while stretching out with confidence that time would allow weeks more to top off the mother’s tank. Leaving the beavers to their flooded world Aki and I move to the forest edge where high tide covers most of the beach. Normally a cold weather sanctuary for sea birds and eagles, we find none today. Only two stunning white dots floating the swell between Outer Point and Shaman Island suggest life. They are big enough to be swans. This entry was posted in Uncategorized on October 27, 2012 by Dan Branch. The cold wind storm that started yesterday morning continues to blow down the streets of Chicken Ridge. Hoping for quiet air in the Troll Woods we head out to the glacial moraine only to find the wind blowing even harder. Early morning sun illuminates the glacier and the Mendenhall Towers it flows through so the turbulent air now buffeting us might have been driven off glacial ice by the first touch of sun. 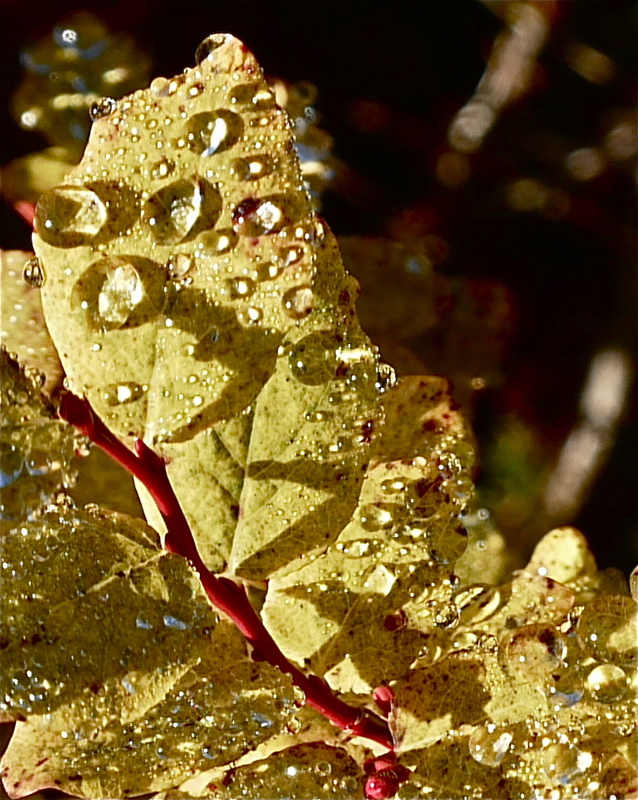 The wind has knocked all the alder and cottonwood leaves to the ground where they lay outlined by frost. Other smaller bushes still retain their yellow and orange leaves. When backlit by the rising sun they glow with rich fall color. One still clinging to the green draws my attention, confirming that this wind driven cold came early to the moraine. Not wanting to cross new ice formed on a beaver flooded portion of the trail Aki stops at its edge and gives me a “if you expect me to walk through icy water you should give me shoes” stare. Looking around to make sure no one will see, I carry her to dry ground. 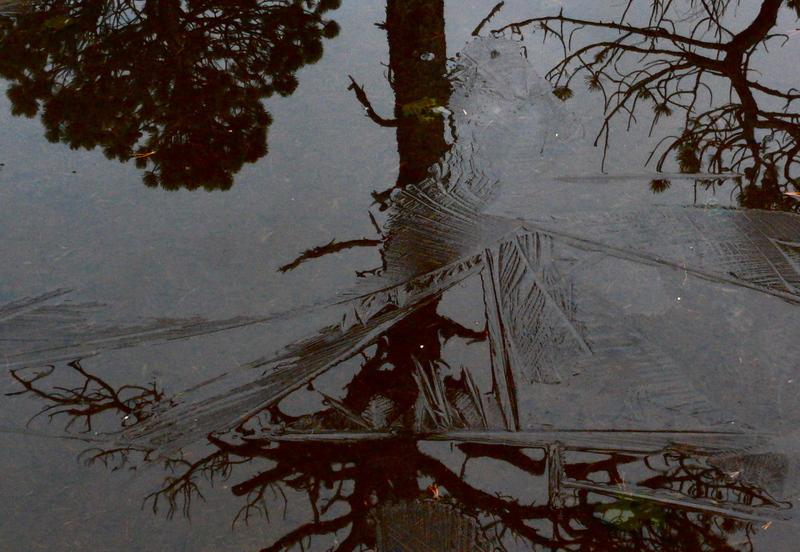 Ice formed last night over most of the first lake we pass but not the second, which being deeper into the Troll Woods offers a perfect reflection of the glacier on its calm surface. Seconds after I take a picture of it the wind reaches even here to ripple the refection. The woods’ mushrooms were caught out by the sudden freeze, Pliable as flesh last week, they now form swollen statues, a few no longer resembling the mushrooms they once were. Turning for home we find that two new beaver dams have flooded a trail that once offering a comfortable path back to the trailhead. The small dams, simple collections of gnawed sticks, only raise the lake level a foot or so. I could destroy them in minutes but don’t. 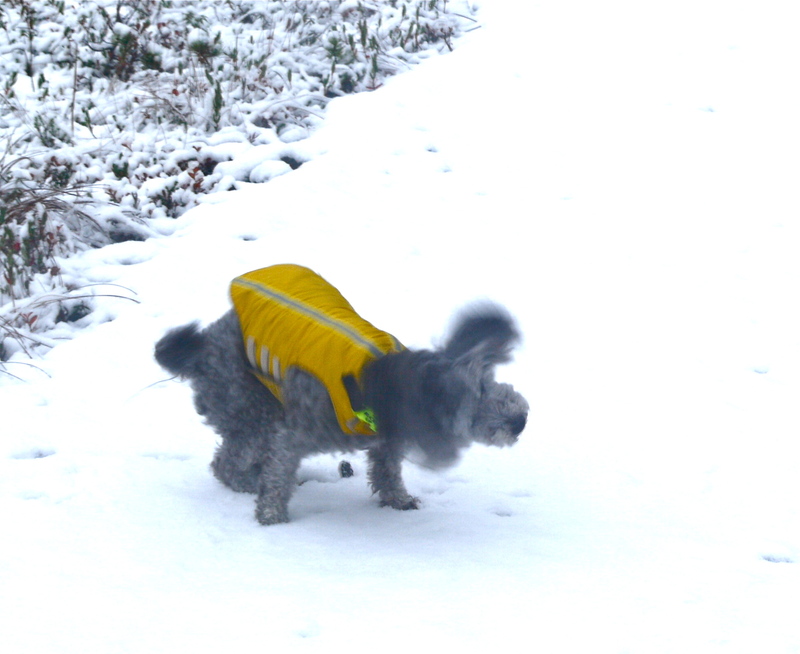 Aki and I retain neutrality in this man versus beaver battle for the moraine even at the cost of wet boots and paws. 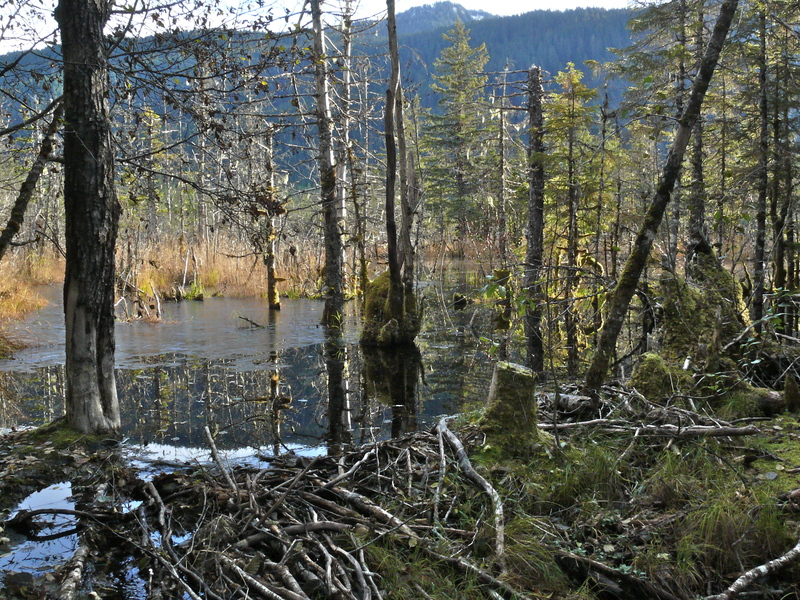 This entry was posted in Aki, Beavers, Dan Branch, glacier moraine, Juneau, Nature, Southeast Alaska on October 21, 2012 by Dan Branch. Aki waits at the edge of a meadow covered with tan clumps of tough grass now bending to the north wind. She doesn’t want to dottle in the cold breeze. I wait too, for the sun to break from its cloud cover and add some color to this monotone landscape. 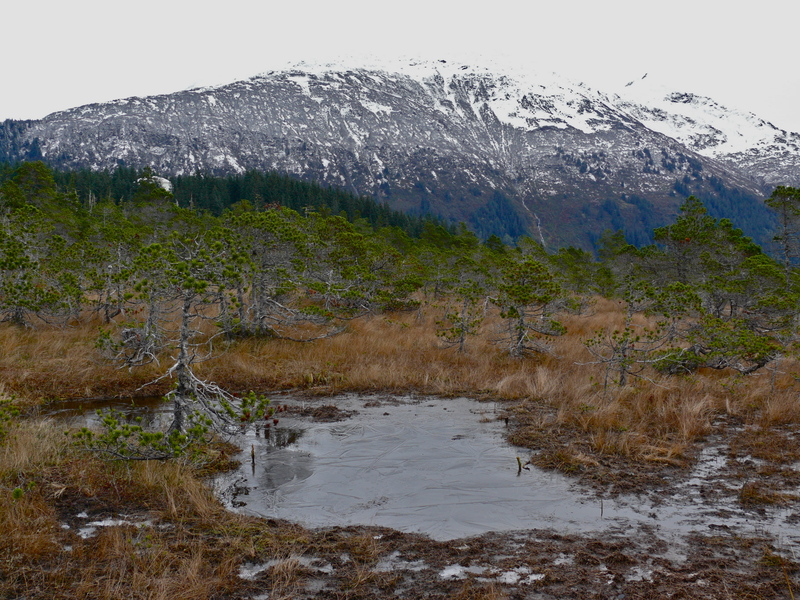 We are about to cross the Gasteneau Meadow and then climb to the Treadwell Ditch trail. This week’s new snow still covers the top halves of Mounts Juneau, Sheep, and Jumbo, all appearing to rise at different compass points from the meadow, their beauty softened grey light. We move quickly up the meadow trail and climb into the protection of second growth woods. Soon we reach the 10 mile long treadwell ditch that immigrants dug by hand in 1888 to provide water for the the Treadwell gold mines. Washouts and invading plants have all but obscured it but you can still make out the railroad ties that once formed part of the ditch covering. I want to walk to the Mount Jumbo trail and then drop down to the old Treadwell mine ruins but a washout has made one of the stream crossing too dangerous. We turn back to the car, ready to face the wind and the winter that will soon follow. 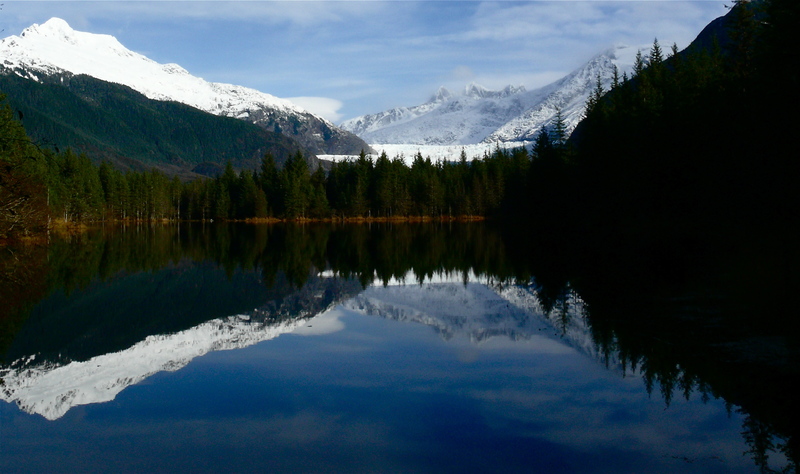 This entry was posted in Aki, Dan Branch, Juneau, Nature, peaceful isolation, Southeast Alaska on October 20, 2012 by Dan Branch. The first snow always catches nature unprepared. We see submerged lilly pads, still in the process of fall die back, through a pond surface made opaque by snow. 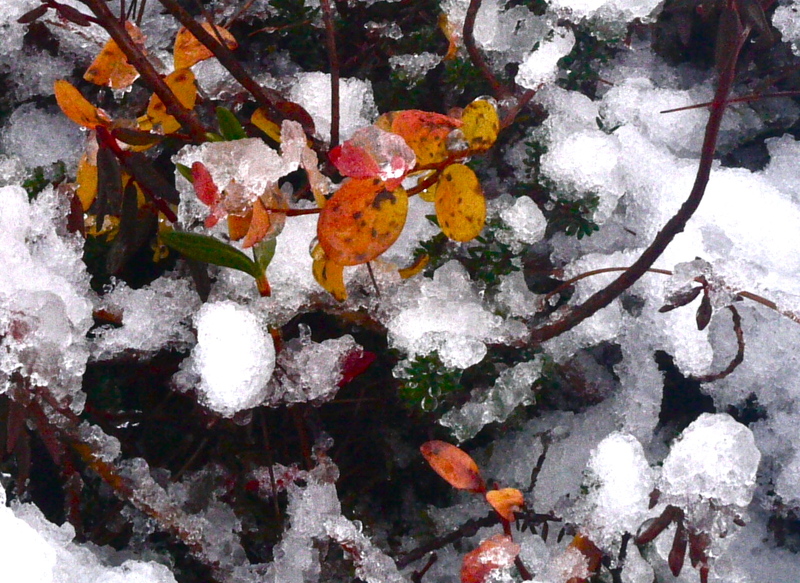 A blue berry bush still in high fall color struggles to shake over its new white coat. They were unprepared for the flick of God’s wrist that brought this early taste of winter. We stay longer than originally planned, knowing that our fickle weather will soon bring a cleansing rain to this world of white. Aki, not yet toughened to winter cold is happy to hop back into the car. 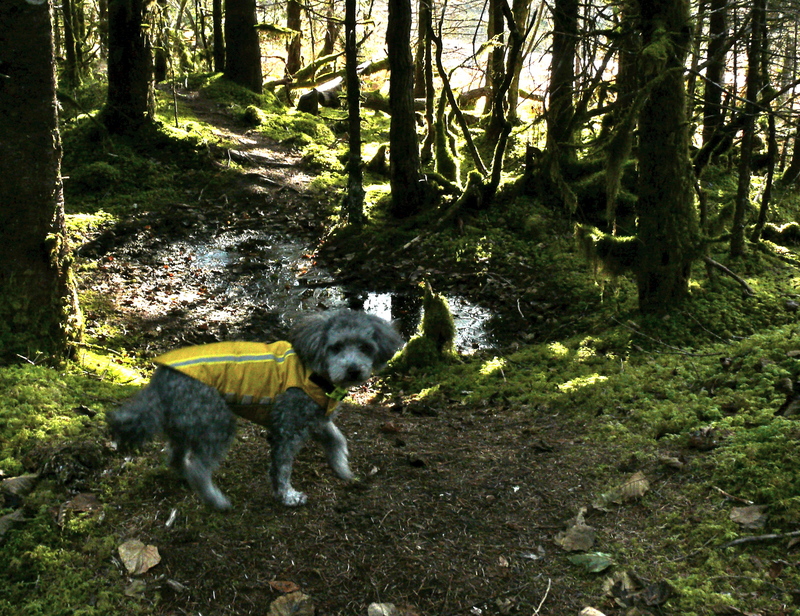 She is just as happy to hop out of it at the Fish Creek trailhead. Here surprising shafts of sunlight break through cloud cover to enhance the beauty of fading fall color. I spot a porcupine, upper back almost devoid of spines, gnawing the bark of a willow bush. Aki, distracted by some dog’s pee mail, doesn’t spot the little guy. If allowed to get too close to a porcupine, a dog can end up with a mouth and face full of quills. Aki, who seems to think of them as slow moving dogs, has managed many close encounters with these spiny guys without picking up a quill. Not wanting to tempt fate I pick her up and we walk past the feeding porcupine. The thick woods along Fish Creek are still holding off winter. 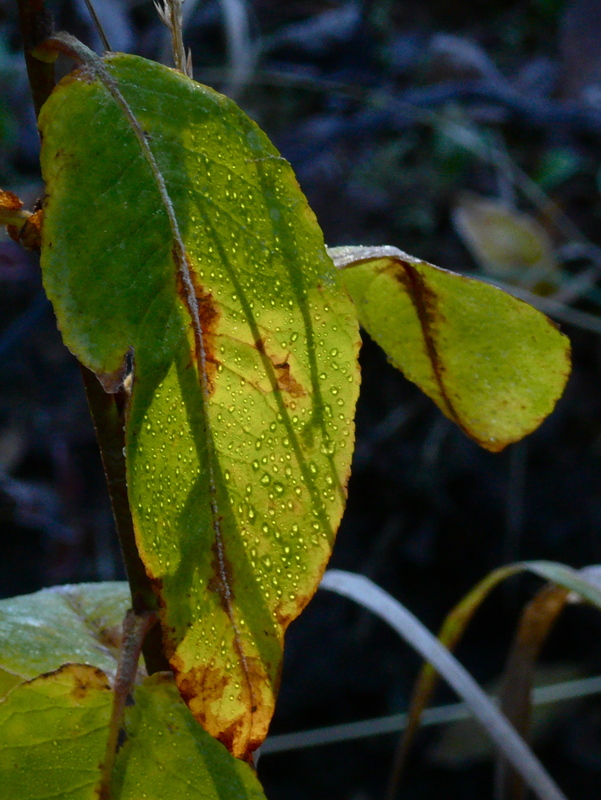 Most bushes are in fall color while some skunk cabbage still sport green leaves. 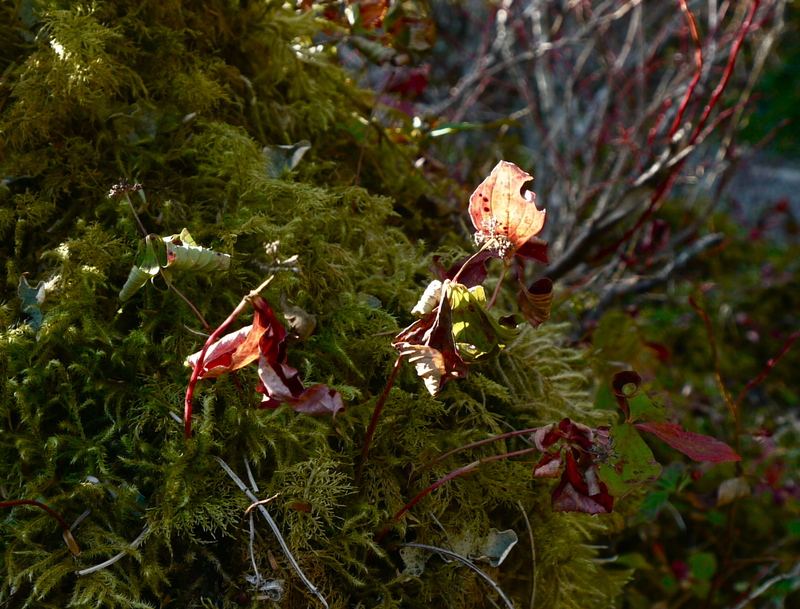 Almost bored after experiencing the snowy drama of the mountain meadows we spend little time in the old growth, finding the strongest beauty in a yellowing leaf apparently too stubborn to join his fallen neighbors now covering the forest floor. 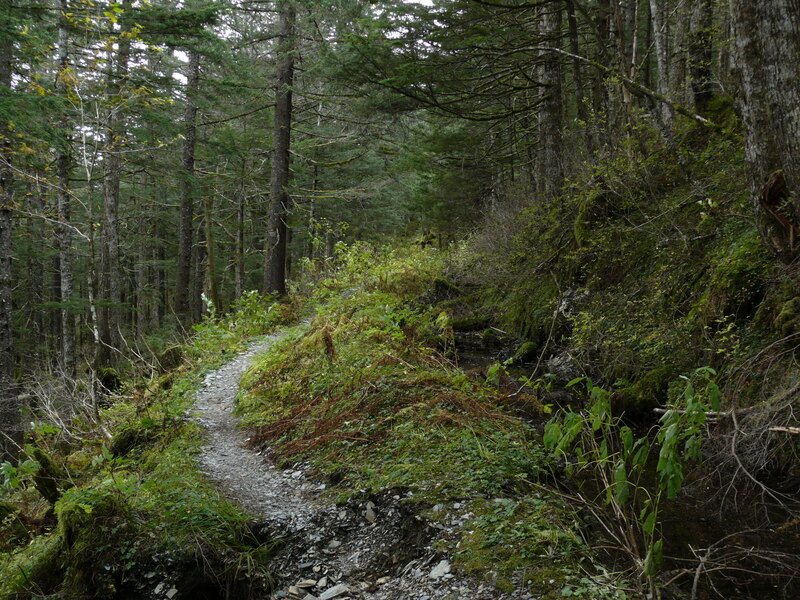 This entry was posted in Aki, Dan Branch, Juneau, Nature, solitude, Southeast Alaska on October 18, 2012 by Dan Branch. 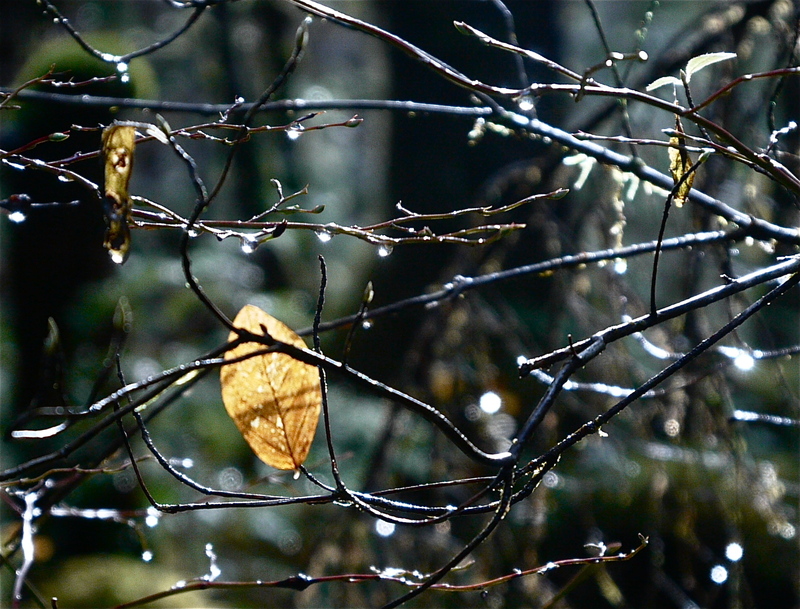 As dwellers of the rain forest we rarely hear the sound of dried leaves crackling beneath our boots. We recently enjoyed a stretch of dry weather but it ended before many leaves had reached the ground. Rain came with a vigorous wind that stripped the tall cottonwoods lining this trail. 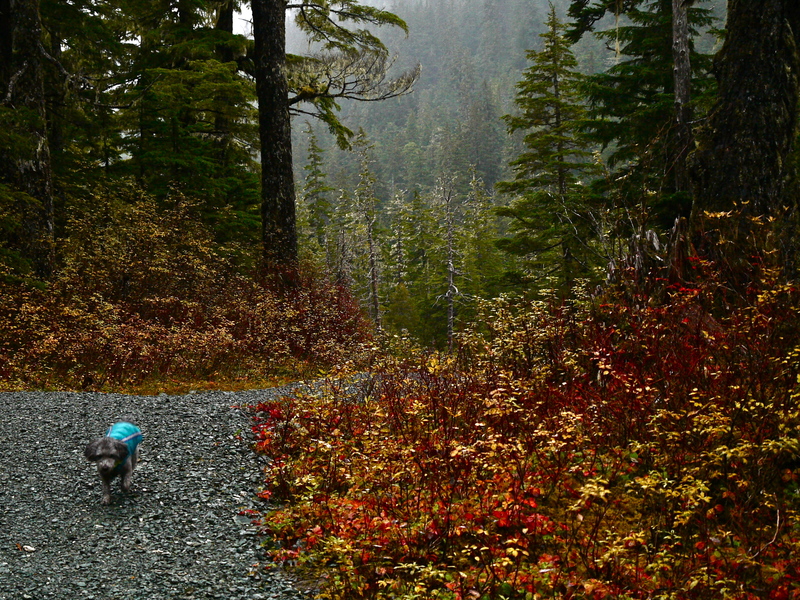 Today dead leaves cover this trail but do not crunch underfoot. 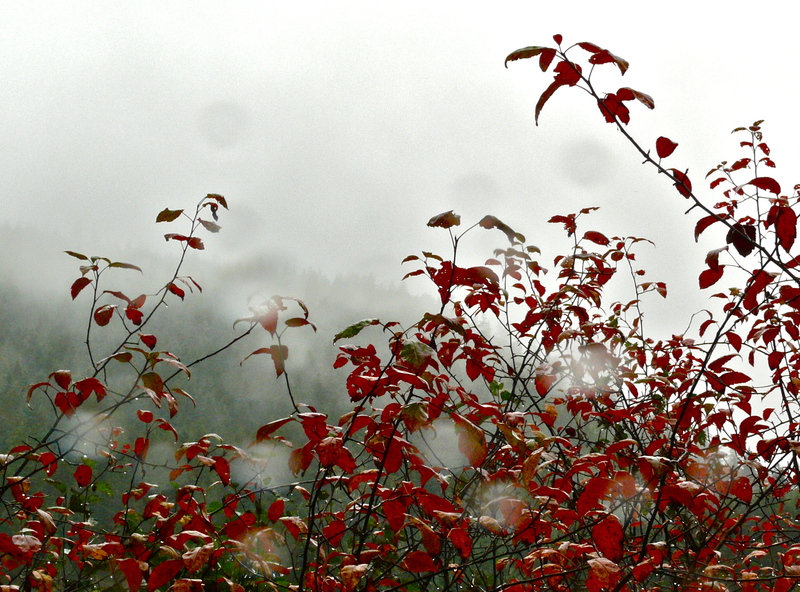 Then the rain strengthens to thick drops that strike the leaves with force to reproduce the sound of a crackling fire. Aki, closer to the sound than I, ignores it. She concentrates on that squirrel streaking arrogantly across her field of vision. Once a squirrel caught Aki’s attention like this and then stopped at the edge of the trail as if waiting for her to catch up. Squirrel and dog faced each other for a moment, the dog’s tail indicating a willingness to play. Squirrel broke for the woods with Aki in half hearted pursuit. They always get away. 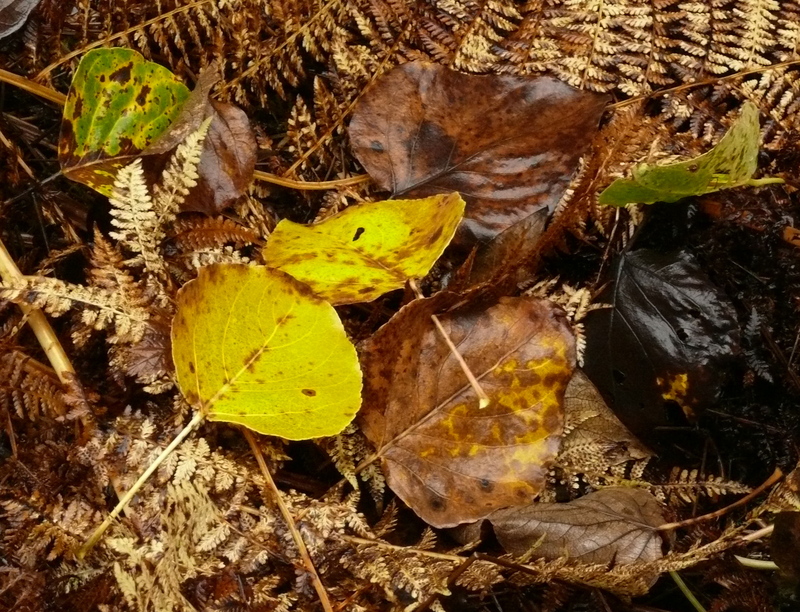 With the rain beating a tattoo on the carpet of leaves we move deeper in the forest where dead yellow and brown ferns collapse against still green brush. Its a scene dominated by autumn browns but punctuated with individual shows of yellows. oranges and reds. 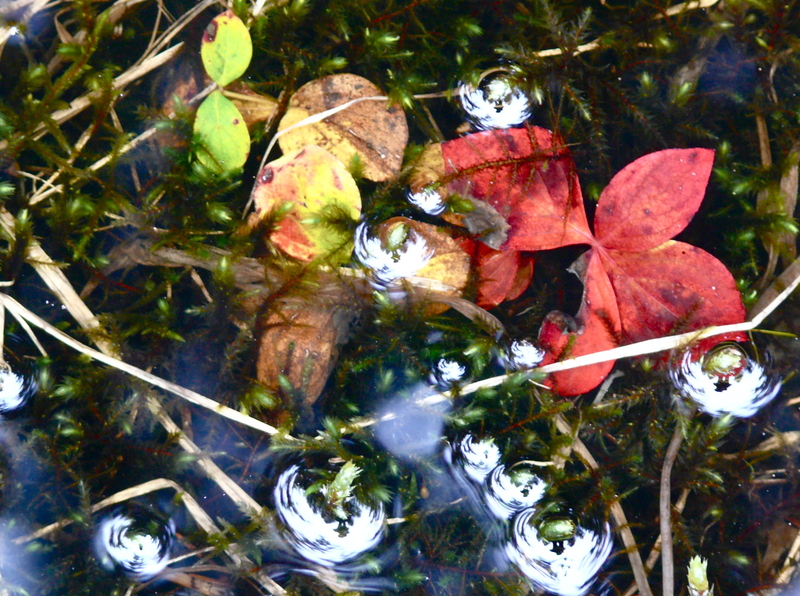 The hugging sorrel show the strongest red even when submerged in sections of flooded forest. A few thin trunked cotton woods still display bright leaves, candles of yellow light in a grey and brown place. We find the riverine meadow nearly covered by a great high tide. 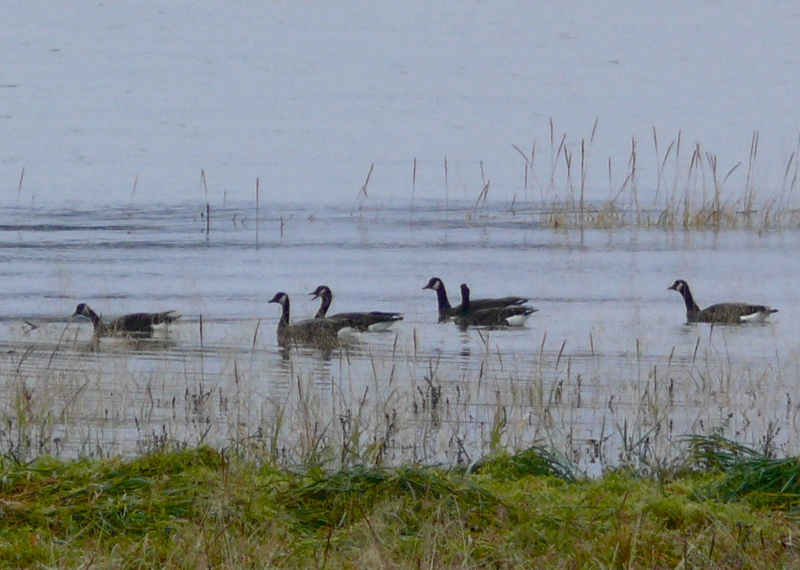 Only the tallest grass stands above the flooding river to form watery islands now haunted by Canada geese. I had timed this visit in hopes of seeing birds driven close by the high water. They usually squat on the sand bars that can reach almost a mile into the sea at low tide. The ebb has forced them here where we can watch them search for food. One raises its closed beak skyward as it seeking a rinse. Another opens her wide while looking with purpose at another goose. Is she telling a great story, or simply telling? 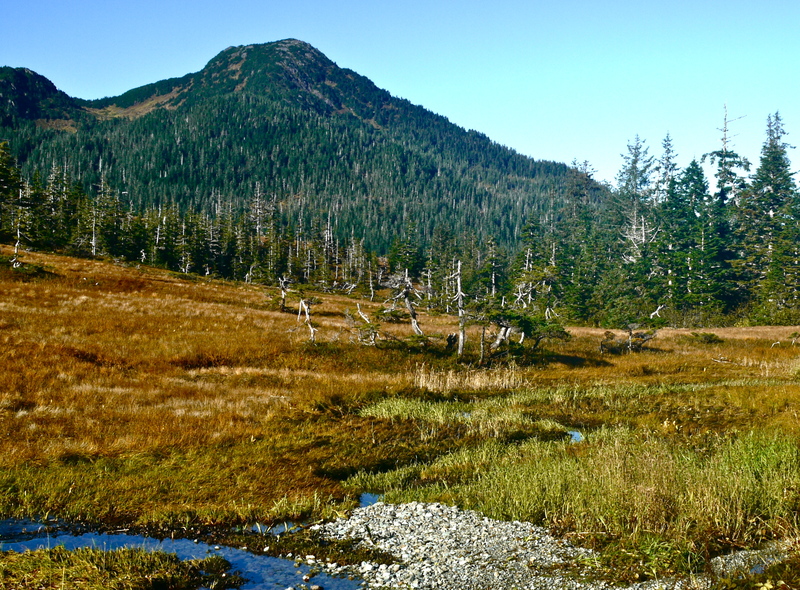 This entry was posted in Aki, Dan Branch, Juneau, Nature, peaceful isolation, Southeast Alaska on October 14, 2012 by Dan Branch. Yesterday winter paid this mountain meadow a visit, lowering temperatures and visibility, painting everything white. The possibility of mountain snow drew me here even through a heavy rain storm that kept the car’s wiper blades working at full speed until we arrived at the trail head. A man stands with arms resting on ski poles and feet encased in rigid downhill skiing boots. Looking the heavy metal skis strapped to his back I asked, “did you find any.” “There was a ball someone made of snow yesterday; yesterday would have been great.” I could only honor his devotional hope. We both long for winter. 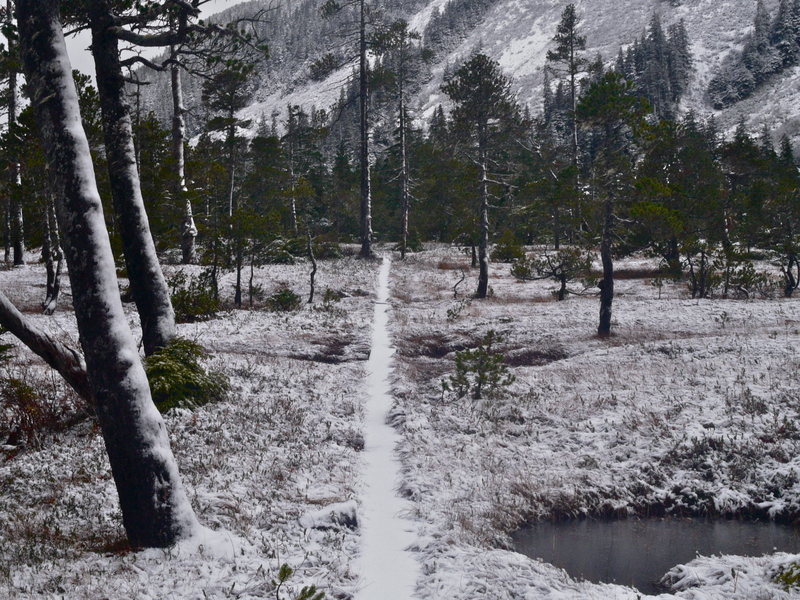 Without a chance for snow Aki and I drop onto a trail leading through a series of meadows to old growth forest. 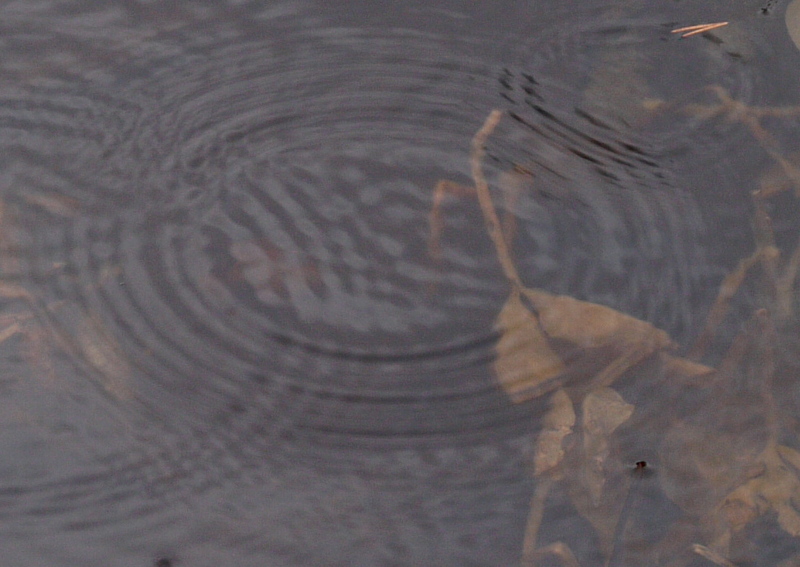 The rain, which had stopped for a few minutes slowly returns, its heavy rain drops creating concentric rings on the meadow’s pocket ponds. Aki waits patiently as I watch the rings spread evenly out until intersected by others. When the rain thickens into a downpour it will be chaos on the water’s surface but now each drop keeps a respectful distance from it’s brothers. Lily pads that had almost covered each pond’s surface now disintegrate near it’s bed. 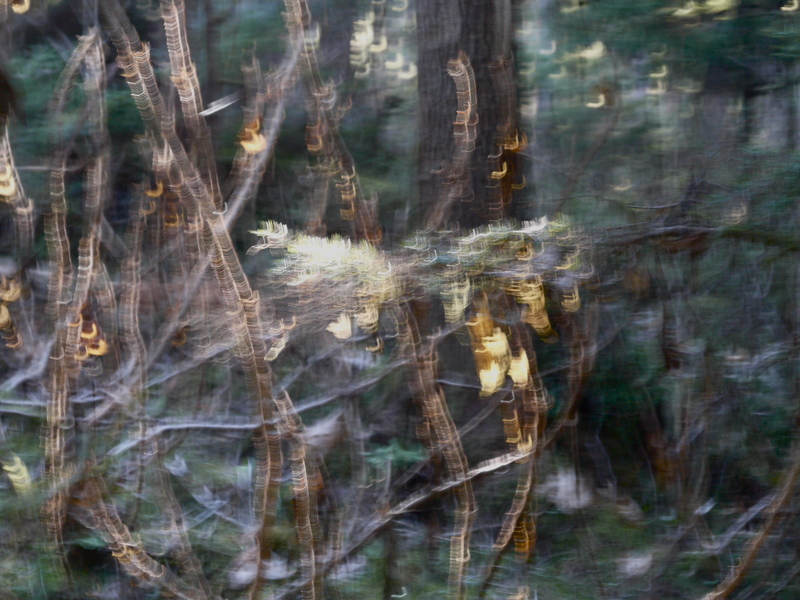 Faded in color but not shape they form a ghost garden distorted by rain drop rings. 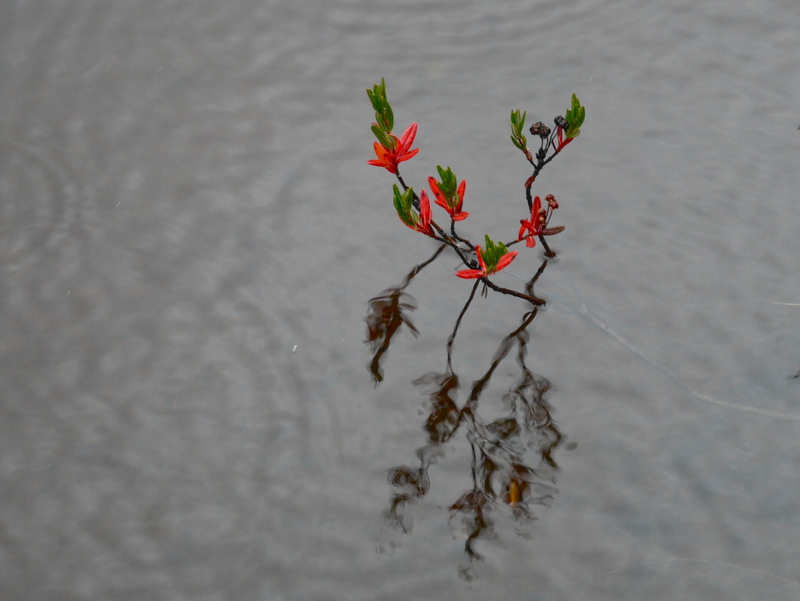 I’m surprised by the forked stalk of Labrador Tea rising from the water. During the heady days of summer it’s mother plant sent it out into the pond to gather light without competition from it’s crowding neighbors. Now leaves showing the bright red of death illuminate the mother’s foolishness. 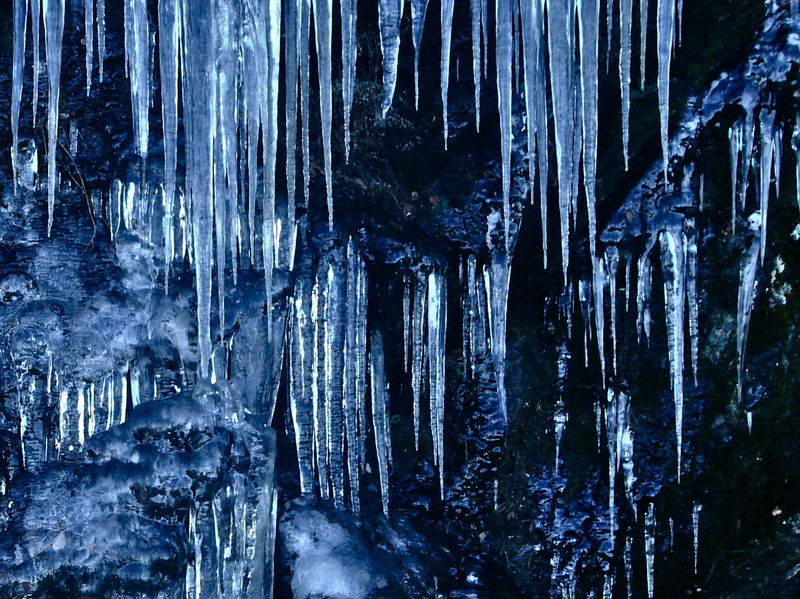 This entry was posted in Aki, Dan Branch, Juneau, Nature, Southeast Alaska on October 13, 2012 by Dan Branch. I am trying to ignore the voice that rises up the mountain from the mouth of a woman heading this way with at least one friend. It never stops or slows. Aki looks forward at a small family ahead of us on the trail. They stop, having just crested the saddle so their toddler can ride a diminutive bicycle around them. The mountain turns in a Fellini set but without nuns or umbrellas. We have left it too late. Normally early risers, Aki and I would have been climbing up this mountain slope at daybreak but for errands and an appointment in late morning that could not be missed. 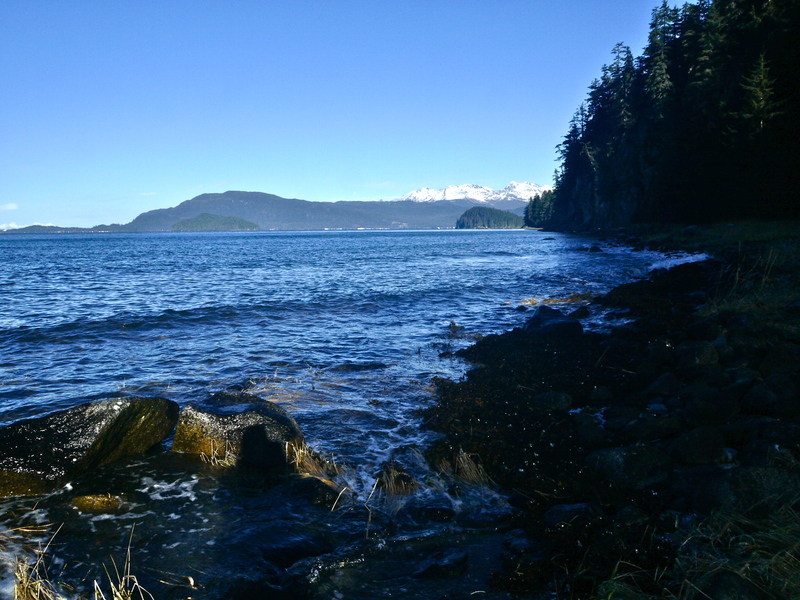 We pass the family, nice folks with quiet voices, and continue to a mountain ridge said to offer a view of Admiralty Island. The voice and her friend pass the family and continue apace with Aki and I. Showing no sign of weakening it fills the air with stories of things that happened far from here and that mean nothing to me. The voice will follow us to the top. 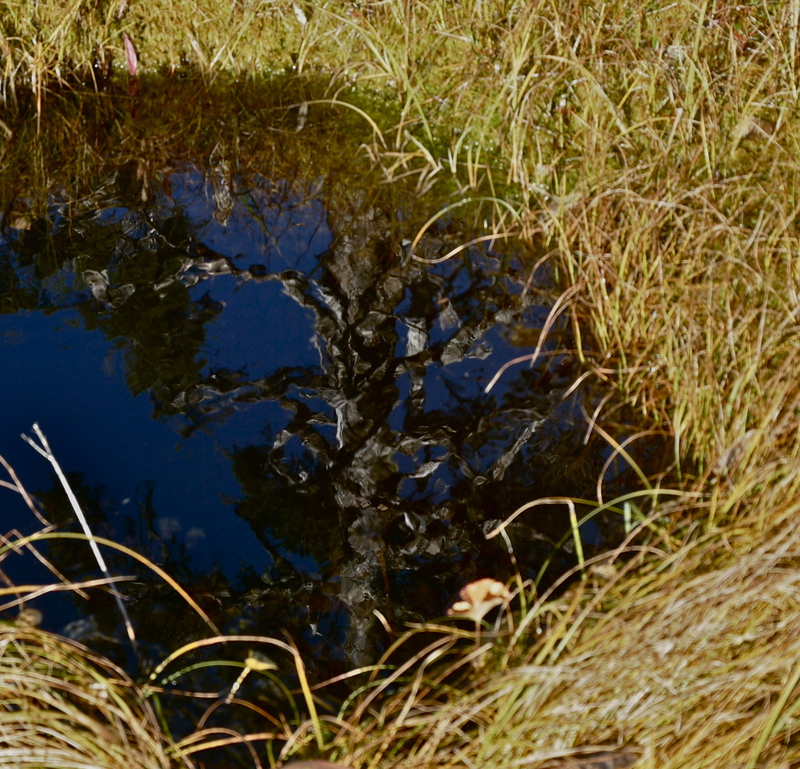 Seeking the smallest solitude I lead Aki off the dry gravel road and onto a wet downward curving muskeg meadow. In minutes we hear only a tiny wind. I’d meant to come up here on the sunny weekend day in late September that we spent in the Fish Creek woods. This meadow would have been a persian carpet of colors that day. Today only low bush blueberry brush and free standing deer cabbage leafs offer some red drama to go with a few grass clumps still showing gold and yellow beauty. Most everything else has faded to early winter brown. We walk where the wind strikes hard at the mountain shoulder before bending downslope to the sea. Few plants can grow more than a foot off the ground. Only wind sculptured mountain hemlocks and the stripped carcasses of gnarled spruce reach high enough to bother the wind. Have I mentioned that the ground and all its plants carry a heavy load of dew drops that soak Aki and my shoes. 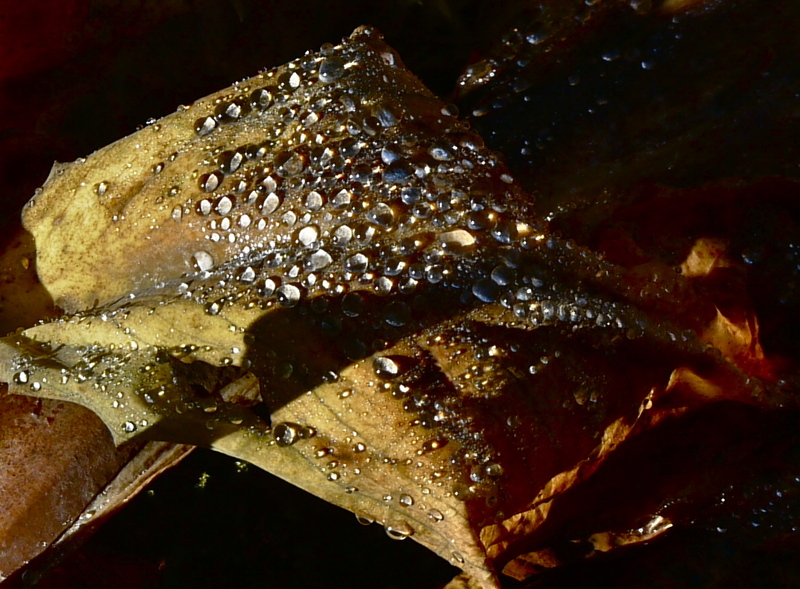 At first I accepted it as the price of escaping the voice then saw the dew drops sparkle with sunlight turning the brown corpses of skunk cabbage into works of art. We find a patch of low growing blueberry bushes that still hold fruit. While I take a picture of the berry forest Aki the brat invades it, knocking over ripe berries as she goes then gobbles up the ones that caught her eye. I manage to find the two or three berries that escaped her pillaging and pop them in my mouth. They taste faded as the colors that surround them. We left it too late. 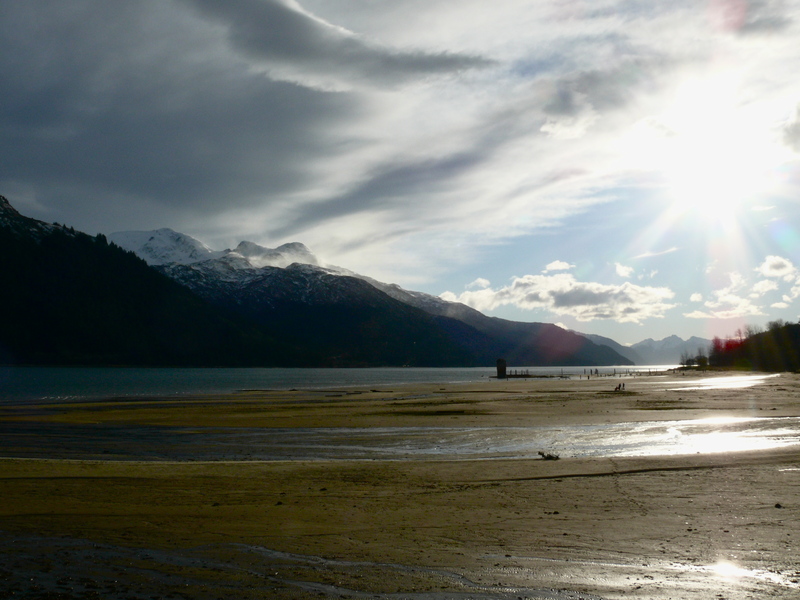 This entry was posted in Aki, Dan Branch, Juneau, Nature, peaceful isolation, solitude, Southeast Alaska on October 10, 2012 by Dan Branch.